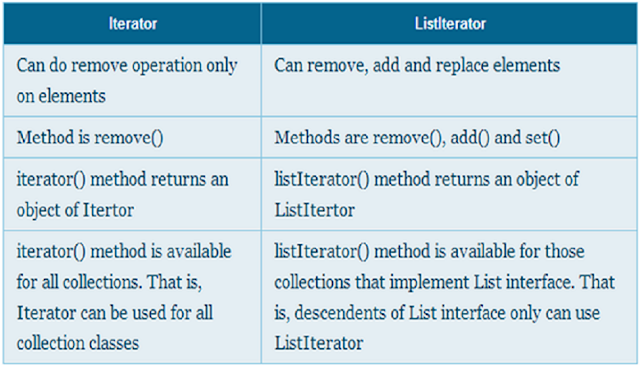 5 Difference between Iterator and ListIterator in Java? The Iterator is the standard way to traverse a collection in Java. You can use Iterator to traverse a List, Set, Map, Stack, Queue or any Collection, but you might not know that there is another way to traverse over List in Java? Yes, it's called the ListIterator. There are many differences between Iterator and ListIterator in Java, but the most significant of them is that Iterator only allows you to traverse in one direction i.e. forward, you have just got a next() method to get the next element, there is no previous() method to get the previous element. On the other hand, ListIterator allows you to traverse the list in both directions i.e. forward and backward. It has got both next() and previous() method to access the next and previous element from List. Unfortunately, ListIterator only supports the List interface, you cannot use it to traverse over Map or Set in Java. That was the basic difference between Iterator and ListIterator class, let's see a couple of more to answer this question in detail on the Java interviews. Let's see each of them in little bit detail. Another key difference between ListIterator and Iterator class comes from the fact that you can perform lot of modification operation using ListIterator e.g. you can add element, you can change element and you can remove element using add(), set() and remove() method, but you can only remove objects using Iterator interface as it only got the remove() method. See chapter 19 and 20 of Big Java: Early Objects by Cay S. Horstmann to learn more about how to add elements while iterating over ListIterator in Java. Another thing which differentiates Iterator and ListIterator is that Iterator is supported by most of the collection class e.g. List, Set, Queue as well as Map which is not a Collection but part of Java's Collection framework. Since Collection class implements the Iterable interface, which defines an iterator() method, all the concrete implementation of Collection classes e.g. ArrayList, LinkedList, Vector, HashSet, LinkedHashSet, TreeSet, PriorityQueue all supports traversal using Iterator. On the other hand, ListIterator is obtained by calling the listIterator() method which is only defined in the List interface, hence it's only available to concrete implementation of List interface e.g. ArrayList, LinkedList and Vector class. You can read Core Java for Impatient to learn more about these classes and Java Collection framework. One of the unique features of List interface is that it provides another overloaded listIterator(int index) method which can be used to strat traversal from any arbitrary index. Unfortunately, Iterator doesn't support this functionality because it has to operate over collection which doesn't support index-based access e.g. Set and Queue interfaces. Anyway, You can easily write an example of iterating over List starting at a particular index in Java using ListIterator. Last difference between Iterator and ListIterator in this list is structural. ListIterator seems to get more feature than Iterator hence got more methods e.g. next() which returns the next element in the list and moves the cursor forward. previous() which returns the previous element in the list and moves the cursor backward. nextIndex() which returns the index of the next element in the list. previousIndex() which returns the index of the previous element in the list. remove() to remove the current element in the collection i.e element returned by next() or previous(). See how to remove object using Iterator for more details. 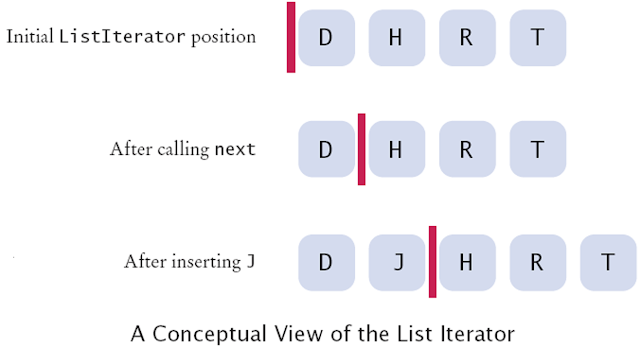 That's all about the difference between Iterator and ListIterator in Java. The main advantage of Iterator is that your code will work even if you pass a List or Set because you will be working with a Collection, but when you use the ListIterator, then your code will only work with the List.